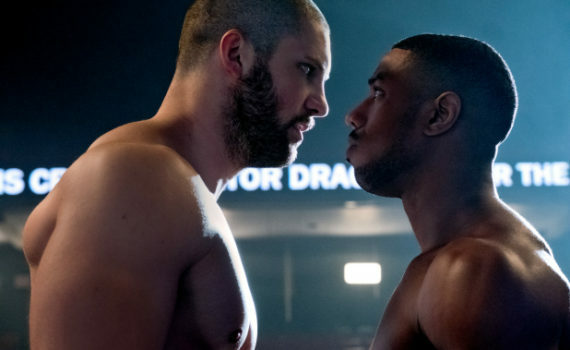 Everything that went right for Creed in 2015 under Ryan Coogler went wrong for Creed II in 2018 under Steven Caple Jr, and it was more than just a director change that did it. But the director change shouldn’t be ignored; Coogler is one of our most powerful modern voices, he’s saying things that we can’t stop ourselves from listening to, and he’s making his mark just when we needed it most. He was too busy doing Black Panther to do another Rocky film, and that’s fine, because now we have one of the strongest Marvel movies in the franchise, which just further proves that the guy (teamed up with Michael B. Jordan in every one of his projects) can do anything. But he wasn’t on hand in Philly this time around, and audiences were on the losing end of that deal, but, again, that’s not the only reason Creed II failed. It just put too much pressure on the weakest links of its chain, and took too many ill-advised risks every time it had our attention, the end result being a movie that we want to love but one that simply isn’t good enough. Adonis Creed, after taking his father’s name and claiming his birthright, has recently become the title holder, a married man, and a father; life comes at you fast. He’s got everything he could ask for, and yet when a new challenger pushes his way into the ring, Adonis realizes how quickly happiness can slip away. The new muscle on the beach; Viktor Drago, son of the infamous Ivan Drago, the very man who killed Adonis’ father Apollo thirty years ago. Rocky still blames himself for Apollo’s death, wishing that he had stepped in and stopped the Russian machine from finishing off Creed before it was too late, knowing that he can’t watch Adonis fight the same fight against the next generation. But Adonis can’t back down; here is the son of the man who killed his pops, what else can he do but step up, defend his honor, defend his title, and represent his family? But our heroes don’t always come out on top, sometimes they get knocked down, but it isn’t about how often we fall, it’s about how quick we get back up, a lesson that Adonis needs help to learn; from Rocky, from Bianca, from his child, and from the spirit of Apollo who lives inside him and watches over every punch. First the positives, because there were many. Michael B. Jordan is a superstar, and my god his muscles would have earned him the nickname “Adonis” even if his role didn’t. He’s so handsome, so talented, so likeable; even as Warmonger you kinda like him anyway, that just proves how powerful his appeal is. He’s back and solid as Adonis here, and wears the cape of his legacy very well, fighting through that struggle admirably. Sly Stallone is strong as well, returning to his roots and doing the part like only he can. And the relationship between the two is great, very unique and very loving, a perfect tool to help the movie flow. Then there are the training scenes, the raw emotions, the iconic songs; if you’re a fan you’ll get what you paid for. But now for the negatives, and there were way too many, way more than there should have been if everyone had been doing their job. The direction was awful, with no pacing and no control and no magic; it was obvious that we had a new guy and that he wasn’t as good. Tessa Thompson, who I really like, was bad in her return to this role, and I hated the musical moments featuring her songs; what did we need that for? And then the returning characters; Phylicia Rashad, Dolph Lungren, Brigitte Nielson. Their lines were kept to a minimum, which was smart, but when they were called into action they were abysmal; on the other hand, Russell Hornsby is great and was hardly used at all. I was left somewhere in the middle by this muddle of a movie, one that I wanted to love but also one that just didn’t have the ability to make me.